Our Outdoor Learning Consultant, Marion McCall, worked in partnership with Browick Road Primary School to develop their EYFS outdoor learning environment. The school wanted to create a larger outdoor classroom filled with new and exciting resources that the children could self-select from. The area would have to bring outdoor learning to life and naturally promote the 7 areas of learning. After working closely with the school and understanding their needs, we designed and installed an excellent child-led learning environment that will improve the lives of both the children and the teachers. For nurturing the children’s physical development, we installed our Kinder Scout Climber alongside a Climb Through Tunnel with Ramp Over. These resources are perfect entry tasks for early years children and offer age specific climbing challenges that will help build climbing confidence. While using both resources, the children will begin to develop their hand to eye coordination, balance, upper and lower body strength, coordination and gross motor skills. We also created a blue Wet Pour Road on the playground surface for children’s bikes and trikes – a great way to practice turning skills. By covering the old paving slabs with a colourful Wet Pour surface, the school can encourage the making of safe obstacle courses that will aid the children’s development of balance and coordination. The Wet Pour surfacing scheme has a pretend river running through it which would be ideal for re-creating 'Billy Goats Gruff'. 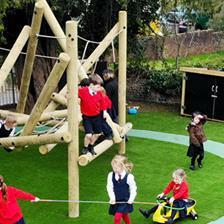 You can view our early years playground equipment here. We created a mound and installed Den Posts over the top of to create an open-ended den-making area. The Den Posts and Mound has created the perfect space for carrying out activities with the learning goals of communication, language and literacy. There are endless learning opportunities for the children i.e. displaying high frequency words so that the children can act out the stories teachers might be telling. For storage and additional mark marking, we added our multi-functional Walk in Store complete with a Chalkboard and Whiteboard. The mark making boards can then be used to practise early writing and numeracy based tasks. Make way for mud pies! Our Mud Kitchen was added to transform the children into little chefs. The children will love getting creative with nature-rich messy play and taking part in role play and investigative fun. It’s also a fantastic resource for children’s PSED as they learn about sharing and taking turns. We added a Dig Pit near to the Mud Kitchen to create a place for children to collect their muddy ingredients when they run low in the kitchen. As the children sieve the soil and dig through the dirt, they will also begin to build muscle control. To create a zone for natural play, we installed two planters which will tract mini beasts and involve the children in selecting, planting and caring for plants. 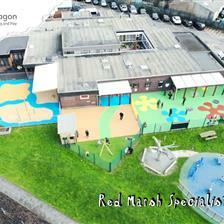 We surfaced the entire area with our natural looking artificial grass which will protect the children from falls and most importantly, ensure the environment can be accessed in all weather conditions. 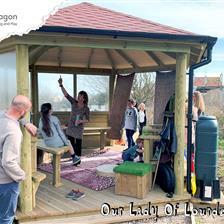 Are you looking to re-develop your early years outdoor learning environment? Contact Us and will be in touch to arrange a free consultation and design presentation.